Kiran, I think what is missing in your view as described above... that you have not described how the palm varies from the fingers (so I think this is one more example of that you have not presented a proper analysis for your association regarding the palm... because the fingers are missing in your association!). Are you saying: palm = inner world, fingers = outer world? Thank you! Yes, I would see the thenar mount area as giving an indication of the amount of physical force, passion or ummph behind the will presented in the thumb. From there I would combine a variety of features to give support and description. Martijn, I think everyone that has posted has shown the contradictions that one side represents an outer, projected or exposed energy and another part of the hand represents an inner or receptive, perhaps hidden energy. All parts of the hand are both positive and negative electrical impulses/charges/energy at all times to varying degrees. These degrees of differences may even vary from moment to moment in the changing hand positions and movements. Reflecting attitudes of the moment. Regarding the thumb, the qualities of the tip show me how much brute force a person uses to enforce their will upon the environment. Perhaps they show a little or a lot. The middle section shows some kind of diplomacy or lack thereof and if you add the base, how much energy a person has and feels inclined/motivated/compelled to use. Then - you add the rest of the hand to this to get even greater details into what is behind the motivations, the preferences and urges, and how these may even have formed. It is the self interacting with the environment. The I applying its will upon you/environment. But, the I is inwardly observing and reacting and adjusting I's behavior to put out the best approach to alter the environment to suit I's preferences. Kiran, regarding your 2nd sentence.... I think you misunderstood the intend of my earlier point: with those words I meant to describe that one can create associative arguments (which eventually might result in inconsistencies) and one create funamental arguments (which should never result in incosistencies). Be aware, the human mind can run in any direction... fundamental arguments will point out whether the mind runs in the right- (based on philosophical reality) or wrong direction (via arbitrary associations). So, it is easy to create an argument, but when the argument does not pass a fundamental analysis... the the argument can be rejected. Martijn, I think everyone that has posted has either shown the contradictions that one side represents and outer, projected or exposed energy and another part of the hand represents an inner or receptive, perhaps hidden energy. Patti, thank you for your answer regarding the thumb. But I could describe this as an 'associative' answer... probably resulting from how you tend to explain things during a reading. But I don't see a fundamental answer to my question (because you basically only described the theory that you use yourself). So, I am wondering... maybe you can also present me a fundamental answer (instead of an associative answer)? "All parts of the hand are both positive and negative electrical impulses/charges/energy at all times to varying degrees. These degrees of differences may even vary from moment to moment in the changing hand positions and movements. Reflecting attitudes of the moment." Because when everything is 'positive' AND 'negative' in the hand... then it would no longer make any sense to continue talking about 'positive' and 'negative', for, one then can not discriminatie the difference between the two in the perspective of the hand! In laws, economics & physics the words 'positve' and 'negative' always represent two fundamentally different states of being in the context fo those sciences... so it would not make much sense to suggest that in the field of hand reading one can not say that anything is 'positive' or 'negative'. For example, when a person uses the rethorics: 'everything is God'... this would raise the question: 'how to recognize God?' And one could also argue from a fundamental view that if 'everything is God'... this would implicate: the devil = God. And therefore I think that the words 'everything is God' are likely to turn out to be recognized as (subjective) 'associative' nonsense.... because those words are likely not much more than a projection of the person's personal concept of God. After all, it's simply impossible to proof that 'everything is God'... even from a filosophical point of view! Different handreaders see the different sides of the hand in different ways. Lynn, have you noticed that in this citate from Christopher's Cyber Cafe writings CONFIRMS your earlier writing: 'water = inner world'...? You later described that the connection water = inner world only relates the quadrants... but Christopher clearly describes here that water does represent an 'internal element' itself! I think this clearly confirms that there is an inconsistency in the elemental approach... regarind the association of the index finger (which is part of the radial side of the hand) with the outer world. Regarding the index finger in general, I think this association is for example confirmed by the fact that in most hand reading systems the index finger gets associated with 'ambition' (e.g. when the head line starts on the mount below the index finger when it gets dissociated from the life line). Ambition is a 'desire' to achieve things; which is a similar quality to motivation... and both are 'cognitive qualities', which always can be said to relate to the inner world. Martijn (admin) wrote: Lynn, have you noticed that in this citate from Christopher's Cyber Cafe writings CONFIRMS your earlier writing: 'water = inner world'...? You later described that the connection water = inner world only relates the quadrants.. I wondered if the whole palm represents the inner world, or whether just ulna side does. I think this clearly confirms that there is an inconsistency in the elemental approach. or is the inconsistency in your understanding of the elemental approach? (or maybe I don't explain it clearly enough). Yes I agree ambition etc is desire to acheive something. I also suggested " the palm represents the inner world and .the fingers & thumb represent how we connect that to the outer world." not the outer world itself. As Patti said "It is the self interacting with the environment." well, maybe the whole hand is our inner world! But how do we connect our inner with the outer world? For the most part, we think 'I want to do something' and we do it! Consciousness. The link you just gave http://www.successconsciousness.com/inner_outer_changes.htm describes how our outer reality is shaped to a great extent by our inner world. Inner changes bring outer changes. Why cannot the fingers and thumb be the vehicles by which we manifest these things out in the world? Perhaps to you my thoughts seem associative and related to doing readings. Yes, absolutely I can say most of my methods I use in reading hands have evolved over the years from interaction with hundreds and hundreds of live samples to observe in and out of their habitats. I definitely have come to not base my readings and interpretations on *applied meanings*. Archetypes, elements and labels are mostly just that for me, labels and memory triggers. This slicing and dicing of the hand into complete sections and quadrants of pure life essence is only a method for trying to divide a moving, pulsing, multidirectional spectrum into boxes or compartments of energies. But, doing this is a human mind's limited break down of something much greater and much more whole. Systems that use such labeling are basic learning systems on how to combine the various pieces and obtain various results. It's is like mixing and matching colors. These systems should be used as a tool or stepping stone to advance to the mixing and matching by quick analysis/association/intuition process that comes to those that actively practice in this field. Imagine trying to do to the heart what you're doing here to the hand and even in the compartmentalized brain it is becoming more known that the brain is not as divided as it once was thought to be. Fingers = mind (The person tends to spend more time in thinking, if the finger portion is longer). The reasons given by you for the objective division of the palm are as below. But, this or the further explanations given doesn't substantiate that ulnar side of the palm gives outerworld and vice-versa. I hope you noticed that I created this topic to initiate a discussion about how to understand the nature of the thumb. How did I create this chart? 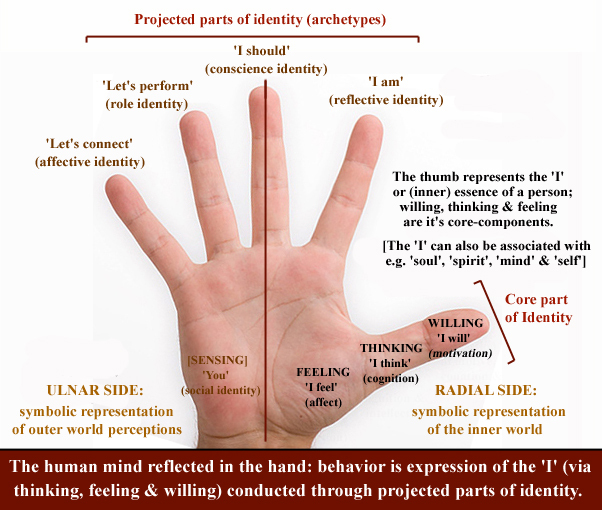 My starting point is the 'classic' approach (seen in most branches of hand reading) where the trinity 'thinking, feeling & willing' is associated with the 3 phalanges of the thumb. And I think it is quite obvious that the 'self' & 'soul' (just like the 'I') can only be associated to represent the 'inner world'.... and not the 'outer world'. Second, regarding the labels that I have used for the 4 fingers: I have destilated those from multiple sources which e.g. describe the associated planetary archetypes, plus the traditional associations regarding the fingers, plus the archetypes described in Johnny Fincham's 2nd book. I hope these now make sense? "Alle zintuigen worden als het ware gefilterd door the maanheuvel. Door de maanheuve ontvangen we de buitenwereld." So... I think I have now explained how the thumb (representing the 'I' or 'soul') is associated with the inner world; I have explained how the pinky finger is associated with the outer world (because communication & relationships for sure require interaction with the outer world); and I have explained who the mount of moon is associated to represents the senses (through which we connect with the outer world). Particularly, w.r.t. the bold text, I re-iterate, what you acknowledged: "I understand your examples as an attempt to describe how one can create arguments regarding how (possibly) any line can be associated with both the inner- and outer world. " But my answer would start with the connection that I presented in my picture: the mount of moon represents our senses... which require the outer world to get fueled with impressions from outside. And I think our senses also play a role in how imagination, creativity & intuition work - though I realise that this very much depends on how one defines imagination, creativity & intuition. Also, please be aware in this perspective how a life line entering the mount of moon is traditionally also associated with voyages, traveling & a more outward life style... and one can also think about the so-called 'travel lines', which are always associated with the mount of moon! Again, particularly, w.r.t. the bold text, I re-iterate, what you acknowledged: "I understand your examples as an attempt to describe how one can create arguments regarding how (possibly) any line can be associated with both the inner- and outer world. " So, at the end... maybe what is missing in our discussion so far is a proper analysis of why the palm became associated with the 'body' and the fingers with the 'mind'...??? A very common error, which is seen, when things are interpreted at micro level. Given a palm(including fingers), this is a broader division / a bird's view to understand where the energy(chi) is spent more. It is like, I have a house map, which says - kitchen is of this size and bedroom is of this size. Your questioning is like - You're getting into kitchen and you see switches there. But, you also see switches in bedroom and then comeback and ask - switches are there in kitchen and also in bedroom. How come you can call one room as kitchen and the other as bedroom? "Hands are wholistic overview and a detailed map. Allow both the sides to serve." To add further, from myside - Don't mix wholistic view with detailed map and vice versa. Okay Lynn, thanks for correcting my obvious mistake there (I apologize, I should have re-read your earlier comments before responding). Christopher wrote: "Now, I know that some of you are going to say: "but the index finger is ruled by water, which is an internal element"... in which case you get my reply: "Aha! so another argument for considering the index finger as being ruled by the fire element then!!"" I can only guess that Christopher must have recognized that there is an inconsistency inside the elemental system, and thus he probably made the suggestion to step over the inconsistency. "the palm represents the body"
"the palm represents the inner world"
Lynn, it appears that you are using the words 'physical world' as a reference to... the body, correct? (I assumed that you have not used the words 'physical world' to refer to the 'outer world'). "inner world is more dominant over the body"
... which suggests that 'inner world' and 'body' are likewise! Lynn, would you allow me to call this a 'contradiction'? ... but then I would say that doing physical activities is by principle more like an 'outer world' activity... so inside your reasoning about the palm, the palm itself gets associated with the outer world - however, I fear that you have not done this with purpose, because it's so deep hidden inside your reasoning that you probably did not notice this yourself. ... Lynn, I am happy to see that we do agree about the nature of 'ambition' as a desire, but I also think that in general, by principle any desire should as a start be connected with the inner world (simply because the desire lives inside us... and thus it is inevitable connected with our inner world). "For psychologists, desires arise from bodily structures, such as the stomach which needs food, the blood needs oxygen, and so on; on the other hand, emotions arise from a person's mental state." So, in general... one could argue that the 'desire for food' is not fundamentally different from the 'desire to achieve something': both relate to the inner world. I would have agreed if you had said that a 'desire to achieve something' can become a motive to connect with the world... however, I don't think that there is a real 'connection' with the outer world resulting from the desire itself. And therefore I could argue that the index finger (desire to achieve) needs the pinky (communication) to make the connection, etc. PS. Regarding your comment: "well, maybe the whole hand is our inner world! "... well, have you read my 'God is everything'-analysis? I think your final comment about how we connect the inner world with the outer world... could become more interesting when we are able to start with a clear perspective... that does not include any contradictive elements. Basically, we need a clear definition for the hand regarding where the inner world and the outer world are found, because... if we would agree and arrive at a point where we must conclude: 'the full hand is inner world' and 'the full hand is outer world', then I would start working on a solid argument to drop both concepts from any topographic hand chart! (digression) This discussion has brought back a memory......When my son was about 8 years old, he and his friend invented a new martial art which they called something like "Kaiwhammy" - the art of tying yourself in knots. Yes Kiran that was a brilliant analogy. I am enjoying your posts in this discussion, a few times you have hit the nail on the head. eg. Martijn (admin) wrote: Okay Lynn, thanks for correcting my obvious mistake there (I apologize, I should have re-read your earlier comments before responding). Thanks for recognising that you misunderstood me and jumped to an erroneous conclusion. You need to understand the context of some of the quotes reproduced here from the cybercafe. They came at a time when we had all resigned from the C.Soc after we found out the truth about Terry Dukes. It was a very difficult time, and we were trying to decide which of his teachings were correct and which were nonsense. eg the quote about "ether must go" was with regard to what we were going to change in the teaching syllabus. Other comments were made about changing the nomenclature of various hand features, astrological associations, mounts, quadrants, distinction between major and minor lines......we were questioning everything! The sentence you've quoted would be like taking any random sentence from this discussion (where we are thinking aloud, trying to work things out) and bringing it up 12 years later. Yes there are arguments why index could be fire, but that's not appropriate to this discussion because it would take hours of long digressions explaining the elemental system to you. There is no inconsistency here. As Kiran said about micro/macro, detailed map & holistic. You don't seem to understand that we are looking at it on different levels. Earth quadrant is on the radial (active) side and the lower (subconscious) half of the palm. But earth is a passive element (a mountain does not move). "the palm represents the body" - the body as a whole is our earth, the physical tangible aspects of us, our shape. ie air or water (thoughts & emotions, inner world) predominate over the earth and fire (physical and action, outer world). What we see most about people is their physical body and their actions (earth & fire). Their thoughts and emotions (air and water) are more hidden. So in this sense, earth & fire are more outer and air & water are more inner. yes, First level, first glance we can look at handshape. "the palm represents the body, the fingers represent the mind" ie the physical is more important than the mental. Second level, we would look at skin texture, but that hasn't even entered this conversation so far! It's not a mathematical formula. Yes the palm can represent the body, yes the palm can represent the inner world, yes the palm and the body can represent the earth, yes parts of the earth are more inner. But the parts of the earth (in this case, the body) that are more inner are subdivided into other elements eg digestion = earth, autonomic nervous system = air. As I said on page 4 "( the fingers represent the mind, the palm represents the body. The physical body is ruled by earth. )but then of course we subdivide it all in many different ways!" What do we DO THINGS with? How do we interact with the world? Via our physical body. What is it that contains everything else such as our organs, our brain, our heart, our nervous system? Our physical body. Where is our inner world contained? Within our physical body. So our earth is both the thing that we do things with, and the things that contains every part of our body, mind, emotions etc. A wonderful & very appropriate narrative of what Practical Palmistry & Palmreading is all about. Rather a narrative for advanced handreaders/palmists....! Which is why I always mention that in crafts, such as this, the 'black & white logic of 2+2= may not be 4 may not happen. I was having the same problem of expressing this is in astrology forums also, but unfortunately my eNGLISH expressions are not good enough to explain this SO WELL. I understand your intentions and efforts in this direction Martijn. Okay Lynn, you explained very well how to take Christopher's words. I am still fully aware of how things developed back then, so I will step-over Christopher's comment... but I think it does show how easily your teacher was inclined to step over a 'fundamental inconsistency' (which he does not rationalize by pointing out to the philosophic perspective of the graduated materiality that the elemental system presents). "earth & fire are more outer and air & water are more inner". At first sight this appears to make sense (in the elemental perspective), because via this approach 3 out of 4 elements of the radial side get associated with the outer world - like you initially described. ... At first sight the result also makes sense in the perspective that in the elemental system the ulnar side is associated with the inner world - according your (earlier?) view. Interestingly, this 'inner' (ulnar) - 'outer' (radial) elemental division would suggests that 'air' should be recognized as the most 'inner' element... because both the air finger and the air palm quadrant are located at the 'inner' side of the hand! "... the more I am thinking the palm represents the inner world and the fingers & thumb represent how we connect that to the outer world. " Lynn, I think you made this move after I pointed out that in traditional palmistry the pinky finger is usually associated with 'communication' & 'relationships'... which is e.g. illustrated by the fact the so-called marriage/relationships lines are found at the palmar zone just below the pinky finger (and I think one could even argue that the archetype of Mercurius is the most 'outward' AND 'active' of the classic Roman archetypes). After I pointed out this you wrote: "I see what you are saying about the pinky finger... "
I see what you are saying about pinky. But I think maybe clutching at straws re moon reflecting light of outer world & our senses. You even gave proof that the senses are widespread thru the hand when you posted the cortical homunculus! The more I think about all this (forgetting about conscious/subconscious) the more I am thinking the palm represents the inner world and the fingers & thumb represent how we connect that to the outer world. I said this originally about the thumb, but I think the fingers can also be considered separately when looking at the divisions of the hand / PALM. And before I point out to this fundamental problem (resulting from a comparison between the elemental system and the traditional approach) regarding the pinky finger, I had already point out that I spotted a likewise problem regard the thumb (I have quoted from Dukes, Fincham & Hirsch and described that the elemental principles used for especially the 2nd phalange of the thumb indicate that the elemental approach does not vary much from the classic principle where this phalange is associated with 'thinking'... which is an 'inner' function (of course). Lynn, I fully understand that the elemental principles of the 'graduated materiality', which leads to the approach to apply the element to different levels of the hand (and different levels of life). - and the ring finger get associated with inner world + more outer.... which also appears to be a contradiction. Now, I understand how you try to rationalize this by pointing out to the philosophy of the elemental system. - And 'consciousness' should be connected with the inner world (one could say that both the air finger and the palmar air quadrant follow principle 1). I think it is hard to associate the other terms with inner & outer; but I think I have now described how the connection between water and 'communication' (as described by Dukes)... via the water ulnar quadrant of the palm explains why it is problematic to associate the ulnar side of the hand with the inner world. "When we observe hands we must be aware that each function we can see represented in them possesses an inner and an outer aspects. Each line representing an outer manifestation of consciousness and also has a line reflecting an inner manifestation." So, by principle... the elemental system is NOT compatible with any strict division regarding any inner- and/or outer side of the hand - simply because by principle all 4 elements are found on each side of the hand, in the fingers and in the palm! The only principle used by Dukes for the radial-ulnar division is the division of 'active' versus 'passive' (but it appears that this should definitely not be associated with any division of inner versus outer). "Well, maybe the whole hand is our inner world! " Lynn, how does this sound to you? I think I have now solved your major problem regarding the 'inner-outer' aspect presented in my picture... because I could argue now that since in elemental chirology each part of the hand is assumed to posses an inner- and an outer aspect, and therefore we can no longer speak of a clear fundamental contradiction between my picture and the elemental system!!! Thanks for your understanding Kiran... I conclude that I have to continue working on describing things in my picture with clean & objective arguments. "Water = Energy / Communication"
"Mercury => Air => Key Attribute: Communication and hermeneutics". I think I can only read this as that in the first description communication is directly linked with 'water', and in the second description communication is directly linked with 'air'! PS. Now, I realize that one can start reasoning via associations that 'communication' has many dimensions... but please be aware that Dukes is describing here some fundamentals, and regarding this example I think you'll probably not be able to deny that this apparent inconsistancy is not explained by Dukes at all. Correct? Martijn, could you explain what is "philosophical reality" as it seems like a contradiction in and of itself? Did you know that the function of thinking itself is brain cells making associations/connections? In other words, I'm not really sure what you meant by the statement in bold. If associative thinking is less valid than philosophical thinking when it comes to modern handreading then we are doomed here. p.s. Please try not to use wikipedia for your answer. What I realized after I had written that, is that what is happening in this discussion is a rearranging of the pre-diced sections. Instead of starting with the actual hand itself, there seems to be a moving around of the already labeled pieces and parts and trying to make sense of them. When they may have been mislabeled in the first place or it was a toss up as to how to label them. Yes, when you reach the advanced stage you are at the place where the experts in the past thought they could label the hands and make a map for everyone else to see what they see. The maps are 2 dimensional and meant to trigger associations. They are just someone's philosophical reality based on the associations they had made. My use of the words 'philosophical reality' was just an attempt to refer to 'reasoning via (established) philosophical principles'. I think in this topic we are discussing the fundamental principles (used in the hand reading literature). And because we are aware that the literature includes some contradictive elements (not only regarding the topic that we are discussing here) therefore I think it is important en maybe even necessary to use proper reasoning only. This should help us to avoid that any 'yes' can at any time become a 'no' via personal associations, because associative reasoning can easily violate an established philosophic principle. PS. Patti, don't worry... I am not proposing 'proper reasoning' as a new standard for recognize 'modern hand reading' in general; again, I am only proposing 'proper reasoning' to find/describe the similarities (and differences) regarding the key-elements of various hand reading systems.